Interview: Where the Wild Things Are Director Spike Jonze! This may only be his third feature film, but I still think it's appropriate to call Spike Jonze a visionary filmmaker. His work, both on the big screen and on the small screen (all of his music videos), is some of the most honest, creative, and unique I've ever seen. A few weeks back, after seeing Spike's Where the WIld Things Are, I went to the Beverly Hilton Hotel to interview Mr. Jonze, and he invited me into bed. I'm not even joking - Spike and I got into bed together (not under the covers, of course!) to talk about bringing Maurice Sendak's beloved children's book to life on the big screen exactly the way he first envisioned it. I wish I had a photo, or video, to prove that we did this in bed, but I don't. Spike had been tired from doing press all day and needed to rest, so since we were in a hotel room, he invited me to do the interview in bed. Sure it was a little bit awkward and very intimate, but I felt that was able to talk with Spike in a way that I don't think most people are ever able to (he said he enjoyed the interview anyway). Where the Wild Things Are is a wonderful movie, representative of exactly the childhood spirit that Spike found in the book when he first read it. There are no spoilers in this, but it's worth reading before and after seeing the movie. Can I join you on the bed? Spike Jonze: Yes, please. If we do this one from the bed it'll be more cozy. This is pretty intense, it's very intimate. Jonze: Yeah, right, it is really. I didn't realize how intimate it was going to be until -- but I just can't stand up anymore. No, no, that's alright. I'd love to start at the top and just discuss how this came together. And, more specifically, how you created a story for a full feature from a book that is as simple and short as it is. Jonze: Well, it's a book that I always loved since I was a kid and it was something I was really hesitant to adapt. Maurice had asked me about it and I was very excited and, because it's something I've loved for so long, but also apprehensive for the same reason. Because I didn't want to just ruin it and I didn't want to add something on there that just is like, I don't know. I wanted there to be a real reason that it's like, "Okay, this is why I have to make this" and yet I needed it to be true to the book. And I think the initial idea was, as I started thinking about it and thinking about what I'd add to it-- any sort of external plot felt really contrived; anything I was going to put onto it. And so I kept, for that reason, I kept saying, "I can't do this," and Maurice and I talked about it a few times over the years and the idea that finally struck me was: "Who are the Wild Things?" And once we met Max and he gets to the island-- because it could've been anything. It's like adapting a poem -- this very, sort of, impressionistic, evocative poem. And there is a narrative there but it's a very slight narrative, it's more the feelings that are really strong. And so, the idea of when Max gets to the island, who are the Wild Things and what do they sound like? And the idea that they could sound like us and they could just talk like us and that seemed really funny to me. But then that wasn't enough to make an idea, that's not enough of an idea, and then I kept going with who they were. I started thinking of them as wild emotions and that was the thing that, sort of, suddenly seemed really exciting. From there you could go anywhere. Really, the story came out of inventing who Max was, inventing who his Mom was, inventing what his home life was, inventing what these wild emotions were and who these characters were, and then letting the story evolve out of the characters. So, in essence, what I got out of it is that the Wild Thing world is part of his imagination, or a representation of that real world. And so what you're saying is that you created that real world first and then the Wild Thing world came from that? That's definitely what I got from it, at least. One of the great things about it is that it's a film that, I think, not only kids can appreciate and enjoy, because it's so fun and full of life and energy, but is also something that adults can enjoy as well. I just wanted to talk more about how you found that balance between something that adults could appreciate yet, at the same time, not being too scary for kids and being something kids could get into as well. Jonze: You saw it yesterday for the first time? Jonze: And how did it-- what had you seen? Were you at Comic-Con and saw that stuff? Jonze: And how was it; how did it compare to what you expected based on everything you'd seen of it up until that point? It definitely lived up to my expectations. Because I think there's a lot more fun that goes on once he gets to the island. Yes, it lived up to my expectations, for sure. Jonze: Oh good, good. And the-- what was your question? Sorry. Just about balancing a movie that adults can appreciate as well as kids. Jonze: Yes, you know, it's weird. We didn't really look at it, like-- we really tried to come at it from making a movie that felt true to being nine years old. And we came at it really from the inside, from making that character honest to what it can feel like to be that age. So, it wasn't so much thinking about the audience and thinking about it from what people are going to get it. But, yes, so we came at it more just from inside than working out and thinking about that. I think, to me, since we were all at one point nine, going back and reliving that, even as adults, we can appreciate it. But I think it's a testament to what you guys did in just creating this that, even as adults, we can enjoy it. Because I think there are so many kids movies out there that I just can't get into and I can't laugh at and I can't enjoy, but this is not one of them. Jonze: Well, thank you. Maurice Sendak never-- I remember he said something that was very striking because it's something I never thought about. I always loved his work and he said, "I don't really view myself as a children's book author, I just try and write about childhood as honestly as I can." And I thought that was-- and it was right towards the beginning of [working on this] and I was already writing kind of in that way, trying to, but it sort of clarified it; it put into very clear words what we were doing. That's probably the perfect way to explain it. I wanted to talk a little bit about the creation of the creatures, the Wild Things. I had read that you first created them with Jim Henson and his shop and that you had used them originally and then something wasn't working out with the faces, correct? And you guys then decided to add them digitally from that point forward? Jonze: Yes, it was a long, gradual process where my initial instinct was, "I want to do everything in camera, costumes, faces, animatronics," and I think long before we even built them I realized-- well, I'm friends with David Fincher and he's always on the cutting edge of effects, he's inventing half of them, and he was in the process of testing Benjamin Button, they hadn't shot it. When we were prepping, they were prepping and there was a period where we were between studios, we'd left Universal, and so he'd given us office space to work out of while we were homeless and he has always been a big supporter of the movie. He's just been, like, from day one, he just cares so much about this movie, it's really sweet, and he's just helped us all so much along the way. And he was always saying, "Don't do the faces animatronically, do them with visual effects." And he basically said, "You're insane if you take all that equipment out, all these remote controls and little servos and all that stuff, out to the locations you're planning on going." And so then I started seeing what he was doing with Benjamin Button. They were doing Benjamin Button downstairs and doing all the tests for that first 40 minutes, the way they did-- you saw Benjamin Button? Jonze: The first 40 minutes of that. And so it got me much more comfortable. We didn't do what he did, he did a fully CG character, we did our own hybrid visual effect process, but we basically abandoned animatronics. At a certain point we were trying to hold onto just a little bit of it, thinking maybe we could get stuff that's going on in the background so we didn't have to animate every face that shows up in every shot, but before we shot we ended up just ripping out all the motors, just trying to get the costumes as light as possible. In essence, though, you still shot with an actual, giant Wild Thing creatures - a guy in a suit? Did his arms move at all? But not the face? Jonze: Everything, yes, he's fully-- Not the face but the head-- everything except the face. They were just very articulate and we were just trying to get real, subtle, complex, nuance performances out of these giant, wild, furry, huge-headed beasts. Because it seems seamless to me, watching it. That's why I asked what was done in camera and what was CGI because everything in it just seemed like it was real. Jonze: Yes, good, that's the aim. I mean, in a way, we weren't even going to talk about all this [behind-the-scenes] stuff beforehand but now people-- as soon as you see it, it is intriguing. BThe intention is that the Wild Things are the Wild Things and they're just-- how we did it should be invisible. I understand. I was also going to ask in relation to that, not to dwell on the topic more, but when shooting with Max, did he have the voices or were the voices already recorded when he was shooting? Jonze: The voices were already recorded. Sometimes he'd hear the voices, sometimes the people on set would do it, sometimes I would do off-camera, sometimes Keener would do off-camera. It was always-- there is no one way to do it. It was like the movie-- it was really whatever was best for that moment, or that scene really, we would do. He's just fantastic in the movie, I love him, he brings so much to it. Jonze: He really did, he really brought a lot to it. Did you meet him? No, I haven't met him and I really want to. Jonze: When you meet him, he just really knows who he is, he's very comfortable with himself and he's not-- he's just a real kid. He's a real kid but a very soulful kid too, he's not like a bratty sort of precocious child actor at all. His Comic-Con appearance was one of my highlights in the whole thing. His little intro and talking about it, was just awesome. Jonze: Oh, good. That's awesome. I want to see him more and more, but how is he going to move on from this because, as you were implying, he's just so perfect in this role? We called them and said, "Okay, we want to hire Max," and they really thought about: "Okay, this is a big thing and do we really want to do this?" And instead of a stage-mom kind of thing, like, "Oh we're going to get--," they were really very thoughtful about it and said, "Okay, well, we're going to do this as an experience; we can do this as a life experience for the family. And we're all going to move down there together and do this as an experience that we're all going to go into." There was no pressure put on Max. They really just treated him as a person involved in the decision [making process] and they are really amazing parents. Yea, it sounds like it. You mentioned Mark Ruffalo and I wanted to ask you: I'm curious why you decided to cast him, or such a prominent actor, for a role that didn't seem very big, where he didn't show up much? Jonze: I don't know. I just love him as an actor. He really loved the book and wanted to participate in it. And there was another scene in it, so there was a scene that got cut out, but there wasn't much of a role and he thought it was hilarious that he was coming to play "the boyfriend" -- his credit is "the boyfriend." And, I don't know, it was really like-- everybody approached it that way. Nobody came in with an ego. Everybody came in just to be a part of it and we were all just there to sort of contribute. I understand. Are you fond of the test screening process? Jonze: No. I think we only did one and it wasn't fun. Because my follow-up question to that is: do you feel that the film, as the final, finished version I saw, is closer or farther from your original vision and from the version that, I guess, you had shot and cut two years ago? Jonze: I think the movie is true to what we set out to make. It's different because the movie always evolves but, like on all my movies, I've edited for, like, a year on all of them, and this one we edited for over a year-and-a-half. And then on top of that, we locked picture last year and then spent the last 12 months doing the visual effects. So it became almost over two-and-a-half years of post but, no, the movie's always evolved. I think that you want to be open to them changing. You want to be open as long as you're getting closer to the intention of what you're trying to do. But this one was just different because it's, like, always making a movie as you're editing, it's like you're wrestling with the movie and then, on this one, at a certain point last year suddenly we were wrestling with the studio behind us, too. And that was even fine but it became a bigger story because it became public. And then there's lots of rumors and gossip about it but, I don't know, it was fucked up and now it's better. Well, that's what I was going to say: I would hope that this final cut is, at least, what you wanted to achieve in the end. Jonze: For sure. I would never have accepted -- I would never compromise. I wouldn't have worked on something this long and cared about something this much and allowed anybody to force me to do anything that I didn't want to do. So, yeah, this is the movie. Thank you to Spike Jonze and Michele and everyone at Warner Bros for this opportunity! I consider it a rare and true honor to be able to speak with Spike. And doing it in bed was something I will never forget. 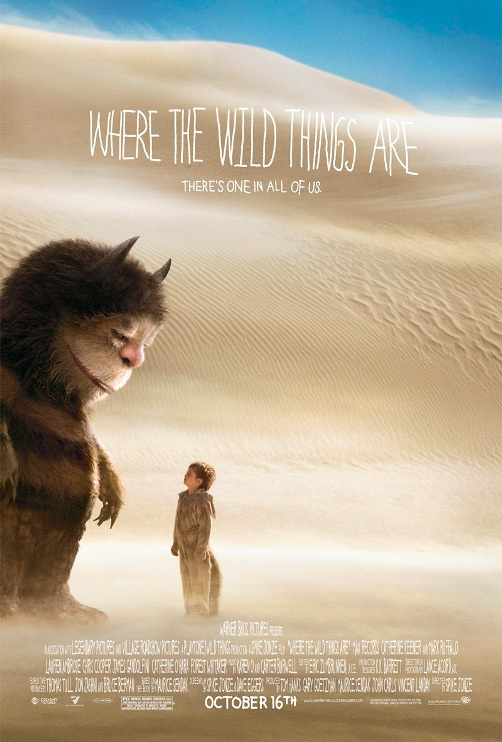 Go see Where the Wild Things Are in theaters this weekend! Great interview Alex. Spike Jonze is definitely one of those directors that had such a unique style and creative approach to all his projects. Trying to see it in IMAX this weekend! I'm glad you asked if you could join him on the bed instead of in the bed because that would've raised some questions. You missed his joke about not being able to stand up. He had an erection. I'm glad to hear and hope deeply that it is the truth that studio heads didn't make/force changes that Spike or Sendak didn't approve of after the public leak that test screenings turned scary for children. Then again, would Spike spit up in the air and state otherwise when money has to be taken into account? I hope for the best regardless as Spike & Sendak are both talents with visions that should be respected. Bravo to Fincher for coming through. Great interview Alex! Did Spike give any hints about future films?? It's very interesting to read that it was David Fincher's suggestion to do this without animatronics. The trailer looks amazing and I really can't wait to see this for the effects!! They're thinking of using this same digital effect for the new live action Turtles movie aren't they? This'll be a good testing ground for it. thanks for the great interview, Alex. it's been a long road for Jonze to get to this point with WTWTA - no wonder he's tired (and horny)! good to hear first hand how hands-on and committed Jonze is to his own projects. his innovative way of approaching directing and his choice of projects to develop aren't linear enough for the mass market, and it may mean that he does not always find a larger audience, but i think this film is a good opportunity for him to have his biggest *commercial* success to date. fingers crossed. Thank you very much for sharing all this information with us. Just awesome.